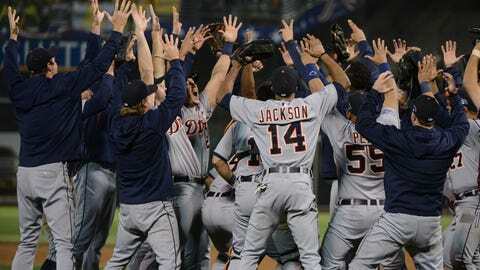 The Tigers celebrate after advancing to the ALCS with a Game 5 victory over the Oakland Athletics in the ALDS. The Detroit Tigers won their third consecutive AL Central Division title, made it to their third straight ALCS and had another MVP and Cy Young winner on their roster in 2013. It was another special season at Comerica Park, and if Miguel Cabrera had stayed healthy, who knows? Maybe the Tigers would have won the whole thing. Although Miguel Cabrera did not win his second straight Triple Crown, he did earn his second straight AL MVP Award. Cabrera, 30, hit .348 with 44 home runs and 137 RBIs, very close numbers to the .330, 44 HRs and 139 RBIs he hit in 2012 in 13 more games. Cabrera did all this while battling hip, abdominal and groin injuries, which eventually required surgery after the season. Cabrera demonstrated why he is the best hitter in the major leagues on Aug. 17 at home against Kansas City. A back-and-forth affair that had seen both manager Jim Leyland and catcher Brayan Pena get ejected, Cabrera came to bat in the bottom of the ninth and did exactly what everyone expected — hit a walk-off home run. Leyland decided that 2013 would be his last year managing on Sept. 7 but he kept it very quiet until after the Tigers were eliminated in the ALCS by the Boston Red Sox. Leyland went 700-597 (.541) in his eight seasons as Tigers manager. Surprisingly, team president and general manager Dave Dombrowski turned to former Tigers catcher Brad Ausmus, who has never managed at any level, except Team Israel during the World Baseball Classic. Dombrowski enlisted former St. Louis manager Tony LaRussa to have dinner with Ausmus and LaRussa came away highly impressed. Not since the days of Ty Cobb had the Tigers made the playoffs three consecutive seasons but that all changed in 2013. For the first time since 1907-09, the Tigers are playoff participants for the third straight year. The Tigers have also won the Central Division three years in a row. Owner Mike Ilitch has empowered Dombrowski to spend a lot of money to build a team that can contend every year and Dombrowski has delivered. Although the Tigers have not yet achieved their ultimate goal of winning the World Series, they know they have a chance. Tigers starter Max Scherzer put it all together in 2013. He went 21-3 with a 2.90 ERA and 0.97 WHIP, started and won the All-Star Game and won the American League Cy Young Award. Scherzer credited adding a curveball to his arsenal for his success against left-handers, who had always hit him well. In 2012, lefties hit .292 against him. In 2013, they hit just .222 against Scherzer. Scherzer had one of his best moments during the playoffs when he came into Game 4 of the ALDS against the Oakland A’s in relief. Scherzer gave up one run in the seventh and got himself into a bases-loaded, nobody out jam in the eighth. He managed to strike out two batters and got the third to fly out, escaping without allowing another run. Scherzer was high-fiving with extra fervor when he reached the dugout. While Scherzer dominated all season, it took a while for Justin Verlander to find his groove. Verlander had an up-and-down — for him — season in which he went 13-12 with a 3.46 ERA and 1.31 WHIP. It was the fewest wins Verlander had had in the regular season since his 11-17 season in 2008. Verlander appeared to be getting back to normal toward the end of the season but really found his sweet spot in the playoffs. He dominated the A’s, going 1-0 with a 0.00 ERA and 0.53 WHIP in 15 innings. Against the Red Sox, Verlander gave up just one run in eight innings but took the loss. After a dismal postseason performance, Prince Fielder was on the outs with Tigers fans. But they figured there was no way that the Tigers could get out from under Fielder’s hefty contract. But on Nov. 20, Dombrowski traded Fielder and cash to the Texas Rangers for second baseman Ian Kinsler. The trade enabled the Tigers to move Cabrera back to first base and move Nick Castellanos back to third base. But Dombrowski wasn’t done dealing. On Dec. 2, he traded solid starter Doug Fister to the Washington Nationals for left-handed starter Robbie Ray, left-handed reliever Ian Krol and utility player Steve Lombardozzi Jr. Dombrowski said lefty Drew Smyly will return to the rotation, Krol will join the bullpen and he expects Ray will be major-league ready sooner rather than later. Had Anibal Sanchez not missed a month because of a shoulder injury, he might have taken some Cy Young votes away from Scherzer. As it was, Sanchez won the American League ERA title by going 14-8 with a 2.57 ERA. Sanchez, acquired from the Miami Marlins before the 2012 trade deadline, signed a five-year, $80 million contract before this past season. On April 27, Sanchez struck out a new team record 17 in a 10-0 victory over the Atlanta Braves. Sanchez broke Mickey Lolich’s 44-year-old record of 15 strikeouts and tied him with Johan Santana for the most strikeouts in a game by a Venezuelan-born pitcher. Jhonny Peralta was having an All-Star season but opted to accept a 50-game suspension for his involvement with the Biogenesis clinic. Dombrowski decided to be proactive and traded promising outfielder Avisail Garcia and reliever Brayan Villarreal in a three-team deal that netted shortstop Jose Iglesias right before the July 31 trade deadline. Garcia went to the White Sox and Villarreal and Jake Peavy went to the Red Sox. Iglesias quickly proved that his reputation as a defensive whiz was not misplaced. On Aug. 12, the Tigers were in Chicago when White Sox catcher Josh Phegley hit a ball that got over the outstretched glove of 6-foot-8 Fister. As he fell to the ground, Iglesias scooped up the ball and flicked it to Fielder, who made the stretch for the unlikely out at first base. It was a dismal late-August series for the Tigers, whose acclaimed starting rotation was knocked around by the scrappy A’s. In the fourth game of the four-game series on Aug. 29, the mood was further dimmed by Cabrera’s early exit from the game after he aggravated his abdominal injury. The Tigers looked to be doomed as they trailed 6-3 in the bottom of the ninth and A’s closer Grant Balfour was in. Victor Martinez hit an RBI single to cut the lead to 6-4 and keep hope alive. Torii Hunter, who had not started the game, came to the plate for his second at-bat of the day and delivered what Cabrera normally did — a three-run, walk-off home run. The April 17 game had already stretched to the 14th inning, with no sign of ending. But catcher Brayan Pena decided to take matters into his own hands, both offensively and defensively. Pena drove in the go-ahead run with a fielder’s choice in the top of the 14th to give the Tigers a 2-1 lead. But that lead appeared short-lived as Seattle’s Dustin Ackley hit a ball into right field that looked good enough to score Justin Smoak from second. But Hunter quickly got to the ball and fired it in. Although he missed cutoff man Omar Infante, Fielder was there to receive the ball. Fielder then sent it to Pena, who awaited the collision at the plate. Smoak, who is 6-foot-4 and 220 pounds, leveled the 5-foot-9, 230-pound Pena but Pena held on and held up the baseball for umpire Bob Davidson, who called Smoak out.